Jacques-Émile Ruhlmann is many a woodworker’s favorite designer. His pieces are sophisticated and filled with interesting details. His name is almost synonymous with Art Deco furniture. Ruhlmann was born in 1879. As he was growing up Art Nouveau, with its use of sensuous curves, dominated French design. But the late teens and twentys signaled a new aesthetic. Rich materials made Ruhlmann furniture luxurious, but even if the pieces had been done simpler woods they would still be magnificent. 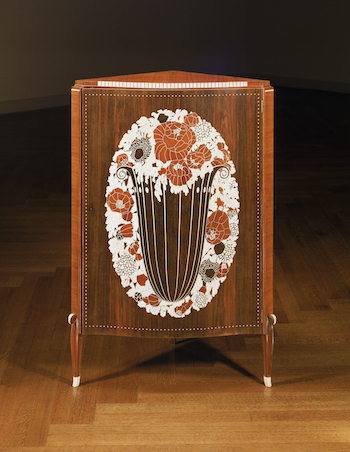 Here is a three-legged corner cabinet from 1916 that uses rosewood, ivory, and several other exotic woods. The stylized vase of flowers fills the front. The ivory borders the top and white dots frame the front.